Sometimes, horrible things happen. And it goes without saying that sometimes, horrible things happen to women. Some happen close to home, others do not, but the good ol’ Internet has a habit of delivering the horrible news to my inbox every day. The Internet is sneaky like that. Wednesday morning was no different and I was alerted to this heartbreaking story. For those of you not yet up to speed, on 21 October 2012, a 31 year old woman named Savita Halappanavar presented with back pain to the University Hospital Galway in Ireland. She was 17 weeks pregnant. After being told by hospital staff that she was miscarrying – she was already 10 centimetres dilated and leaking amniotic fluid – and after enduring severe pain for a day, she asked for a medical termination. According to her husband, Praveen Halappanavar, Savita requested a termination several times over a three-day period, but she was refused each time because the foetal heartbeat was still present and, they were told, ‘this is a Catholic country’. She spent a further two and a half days in agony, shivering and vomiting, until the foetal heartbeat stopped and the dead foetus, which had no chance of survival outside of the womb in the first place, was removed, but not before she collapsed in the bathroom and was given a token dose of antibiotics. Savita was moved to the intensive care unit for treatment but it was too little, too late, and she died of septicaemia and E. Coli a week later on 28 October, 2012. Investigations launched by the Health Service Executive and the hospital respectively are currently underway, as is aligned with hospital policy, but this doesn’t seem to me to be a black and white case of ‘whoops-a-daisy, we made a mistake’. No, this is something far more sinister that speaks to a country’s archaic abortion laws that lay down its illegality and deny women their freedom of choice. According to a 1983 amendment of the Constitution of Ireland, the unborn has an explicit right to life from the time of conception except when it is performed to save the life of the mother. Now, I’m no expert, but surely this woman’s condition qualified her for a termination under the law? Were the staff acting of their own volition, or were they blindly following “hospital procedure” and the law? Did fear of prosecution prevent them from doing the right thing? Did their religious beliefs come into play? 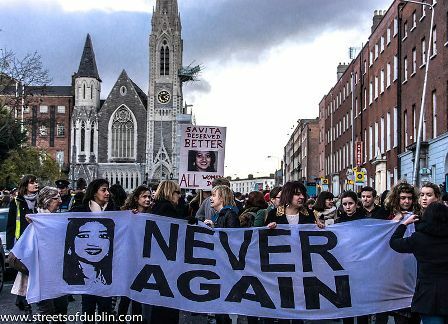 Did they fear divine retribution and a swift trip to Hell had they given in to Savita’s desperate pleas? And how many women’s lives have been similarly risked and will be risked in the future because of this law? I linked to the article on Facebook, which is what I usually do when something particularly pisses me off – c’mon, I’m sure I’m not the only one— and waited for my friends to share my outrage. They did, of course, (except for one obnoxious troll) but what one girlfriend told me surprised me. Feeling similarly disappointed with what had happened to Savita, she read the story aloud to a colleague, who she assumed would share her concern. ‘Regardless of whether the heart was beating or not, if her choice was to abort, then she should have been able to abort,’ insisted my friend. I guess she’s right. Miscarrying and suffering in a hospital bed with a full medical staff of onlookers who are both unwilling to intervene and insistent that there was ‘nothing to be done’ is rather dramatic, especially with a life hanging in the balance and all. Not to mention that pesky bout of septicaemia and E. Coli that swiftly killed her. Pass the popcorn, please. This sure beats the midday movie. Laws aside, what this speaks to is an attitude; an attitude not limited to the Republic of Ireland and other places around the world where “horrible things happen” – it exists in our own backyard; it is shared by the men and women you travel with on the bus or buy your coffee from in the morning; it is confidently spouted by the people you work with, who otherwise seem “cool”, as my friend was unfortunate enough to discover; it is shared by your friends and family who insist you ‘don’t eat this’ and ‘eat more of that’ and ‘take your vitamins, don’t you know it’s good for the baby?’. It is an attitude that says, once pregnant, a woman loses her autonomy and any right she once had to dictate what happens to her body, especially when faced with a medical emergency, simply because she is growing a bunch of cells inside of it. It is an attitude that says a woman is merely an incubator; that her life is somehow worth less than those cells. And it is yet another example of Government and bureaucracy and religious doctrine clawing their way into women’s bodies – a place where none of these things have ever belonged. The doctors, nurses, medical staff et al that we entrust so willingly with our lives just need to do their jobs and do what’s right by us – their patients. Savita Halappanavar was the patient; the hospital and its medical practitioners had a duty of care to her, not her unborn foetus, and thanks to an archaic law, they just let her die. It’s currently illegal to sell a condom to someone under the age of 17. A girl under the age of 17 cannot be charged with a sexual offence, but boys under the age of 17 can. Roughly 20% of the population believe that abortion should be illegal even when the woman will definitely die unless she has one. The majority of citizens don’t want women to have full abortion rights. There have been 5 referendums in the last 30 years regarding abortion rights. The government has previously refused to allow Irish citizens to leave Ireland because they believed they would have an abortion in a country where it is legal. Unfortunately, I believe this is one of the consequences of democracy. If the majority of people want to live without freedom and choice (even for illogical reasons) it’s difficult to refuse them that right. I would prefer to live in a limited democracy, where important things are decided by the best and brightest, and where we have a constitution that ensures our basic human rights will always be protected. When there are medical experts and ethicists available to determine a reasonable abortion policy, it seems absolutely crazy to me to ignore them and instead choose to base policy off a survey of people’s biases (who never seem to understand that things that don’t hurt them are none of their business). This entry was posted in Featured, Opinion and tagged abortion, abortion laws, womens rights. Bookmark the permalink.